Visualization of surface elevation data is important. Being able to view data in 3D, color-coded with elevation, sun shaded, blended with attribute data, and even draped with imagery is becoming more customary. Three main regions exist for visualizing and working with elevation datasets: 2D map views, 3D scenes, and 3D globe views. ArcGIS provides applications that enable large elevation datasets to be stored and visualized using each distinct view. Rasters, TINs, and terrain datasets all provide a method to store and visualize terrain data in 3D. Large volumes of surface data can be consumed in ArcGIS through a terrain dataset. The terrain dataset has a level of detail behavior predefined when it is built, allowing the storage of mass numbers of surface measurements. 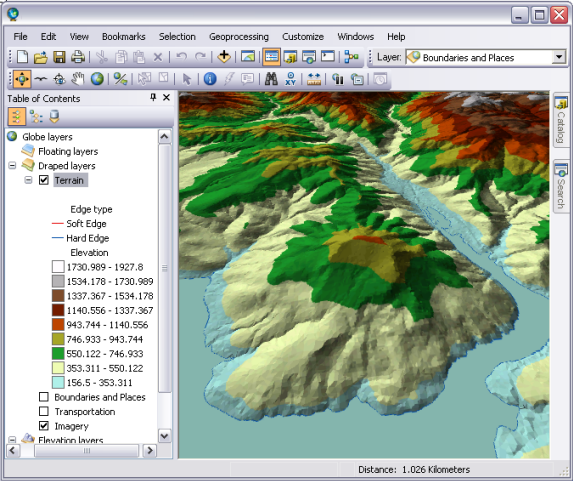 Terrain datasets can be visualized as a 2D map in ArcMap and as a 3D globe in ArcGlobe through a terrain layer. This layer type is similar to TIN layers in some regards: It supports multiple renderers. You can view the triangles colored by elevation range, slope, aspect, and hillshade. You can also see the breaklines, triangle edges, and nodes of the triangulated surface. In terms of differences, terrains have the level of detail (LOD) capability that helps speed up the display, particularly at small scales, when a large volume of data is involved. Terrain datasets are unique in that they can either embed or reference source data. Through the indexing of each point measurement, a set of pyramid levels is generated, each with successively fewer source points. This allows ArcMap and ArcGlobe to generate a TIN surface on the fly at whatever resolution is needed for the scale of the viewer. Small-scale displays of data require fewer points, and thus, a lower-resolution TIN is rendered. Rendering very large TINs is generally difficult, partially due to limitations of hardware such as video cards. Terrains are beneficial in that you render the areas that you need to visualize at an optimized resolution. Terrain datasets are supported for reading and viewing at all licensing levels. 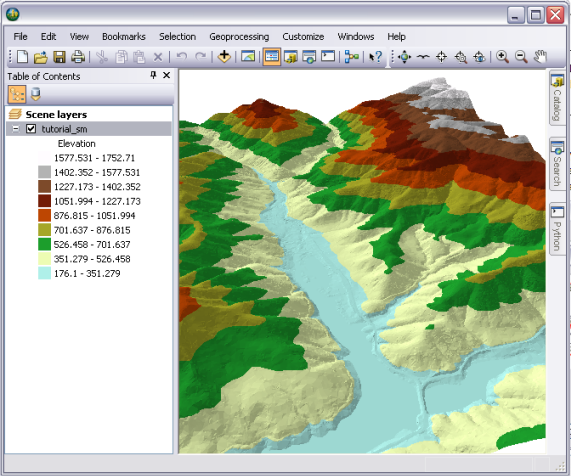 However, a terrain can only be created with the ArcGIS 3D Analyst extension. The 3D globe surface in an ArcGlobe document can be derived from a terrain layer. The surface is rasterized on the fly to provide the information needed for the globe surface geometry. It is generally more efficient to convert a TIN or terrain layer to a raster digital elevation model (DEM), and to use the raster in order to avoid the ArcGlobe step of on-the-fly rasterization of triangulated data. Therefore, the use of derived DEMs is recommended over direct use of terrains and TINs. To convert a terrain dataset to a raster DEM, use the Terrain To Raster tool. Using ArcScene, 3D scenes can be generated. Natively, ArcScene does not directly support the terrain dataset. To generate surface models for 3D scenes that retain the detail of a terrain dataset, subset out the terrain dataset to a raster DEM or TIN surface model. To convert a terrain dataset to a raster DEM, use the Terrain To Raster tool. To convert a terrain dataset to a TIN, use the Terrain To TIN tool.